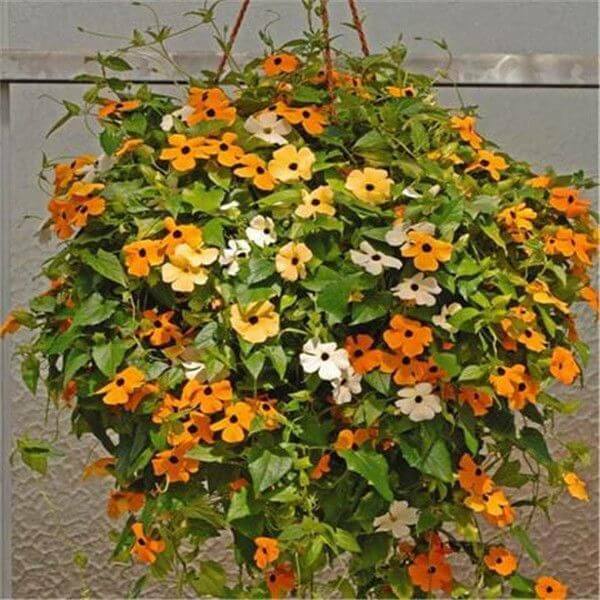 A fast growing climbing vine that has dark green pointed heart shaped leaves and bright orange to yellow flowers with a central dark spot. Best suited to warmer areas where it will flower year round. A Black-Eyed Susan Vine updated with photos throughout the summer so you can see how fast they grow and how utterly gorgeous this flowering vine is. Black eyed Susan vine growing herbaceous vine of the genus Thunbergia also known as Thunbergia alata, Black eyed Susan vine, perennial evergreen but in colder climate grow as annual, used as ornamental plant, can grow in mediterranean, desert, subtropics, temperate, tropics climate and growing in hardiness zone 9+ as perennial 5+ as annual.